In December 2013, the Mexican government ratified amendments to its constitution that will liberalize the energy sector. Political momentum to liberalize the oil and gas sector has been building since former President Felipe Calderón’s 2008 legislative attempts to introduce private investment. Although these reforms were ultimately unsuccessful, they focused political attention on the impending crisis of steep oil production decline and increasing oil imports. Mexico remains one of the world’s largest oil producers and is the third largest foreign source of oil for the United States, but a failure to invest in exploration and production and an overwhelming tax burden has caused Petróleos Mexicanos (PEMEX) to evolve from a national champion into a flailing corporation. The reforms proposed by the Institutional Revolutionary Party (PRI) of President Enrique Peña Nieto would maintain exclusive state ownership of the subsoil’s resources while introducing private investment directly into downstream activities and through joint ventures in upstream activities. PEMEX will still remain the preferred national champion, but will no longer hold an exclusive monopoly on the vertical production chain. Although the PRI still has to ratify secondary legislation and hurdle a national referendum called by the opposing political party, for private companies, these obstacles pale in comparison to the prize: access to 10.07 billion boe (barrels of oil equivalent) in the largest unexplored reserves outside of the Arctic Circle. On March 18, 1938, Lázaro Cárdenas nationalized the oil and gas sector of Mexico with overwhelming public support following a long struggle between Mexican labor unions and foreign oil companies. Citing Amendment 27 of the 1917 Constitution, which declared hydrocarbons to be the exclusive property of the state, Cárdenas confiscated assets from the companies now known as Exxon and Chevron and reasserted the state monopoly through the creation of PEMEX. To this day, March 18 remains a national holiday and it was during this time that the phrase, “El petróleo es nuestro (The petroleum is ours),” became a popular chant. However, Cárdenas did not believe that full control over the vertical chain of production would be profitable and tried to integrate private companies in ways that would not affect state ownership of resources. A failure to invest in exploration and production and an overwhelming tax burden has caused Petróleos Mexicanos (PEMEX) to evolve from a national champion into a flailing corporation. The 1958 Petroleum Law was the legal mechanism used to create a vertical supply chain monopoly. By requiring that service contracts be paid in cash, the legislation also effectively shut out private investment in the sector. This law fenced PEMEX into one of the strictest oil and gas legal frameworks in the world. Effectively prohibited from forming “horizontal partnerships” with private companies, it could not safely take on high-risk, high-cost, or high-tech projects. The giant oil field, Cantarell, was discovered in 1976 and production began in 1978. This field was so massive that during its peak production years of the early 2000s, its output – 2.1 million barrels per day – was second only to the Ghawar field of Saudi Arabia. Although PEMEX did use enhanced oil recovery methods on the field in the late ‘90s, production decline was rapid: in 2004, 63% of Mexico’s production came from Cantarell but in 2010, that rate had fallen to less than 10%. Over the course of its lifetime, Cantarell has earned $500 billion for the country. Production from the adjacent Ku-Maloob-Zaap (KMZ) field has somewhat offset the decline of Cantarell, but peak production at the KMZ field has been approximately 810,000 barrels per day. Many within the Mexican energy industry believe that KMZ has peaked, and Cantarell has been steadily declining for the past twelve years. The stagnation and decline, respectively, of these two fields has naturally produced a correlating decline in total production. Furthermore, approximately 80% of all oil fields in Mexico are in a state of decline. In 2004, production peaked around 3.5 million barrels per day. Last year, production was just over 2.5 million barrels per day. Aggravating this swift decline is PEMEX’s failure to invest enough capital into exploration. Facing declining giant fields and only smaller replacement fields, Mexico is confronted by the very real possibility of becoming a net oil importer, according to a study by Houston-based Rice University. The greatest potential for increased production lies in deepwater reserves and the portion of Eagle Ford shale that extends into northern Mexico but both of these options require significant investment, which places these reserves squarely out of Pemex’ reach. The revenues that the government receives from PEMEX account for over one half of PEMEX’s earnings and comprised 34% of the government’s revenue and 16% of its export earnings in 2011. In 2008, the administration of former president Felipe Calderón tried to stem the production decline by introducing a set of reforms. Unfortunately, their utility was invalidated by the fierce resource nationalism of the Mexican public. They were reduced to a set of regulatory reforms and eventually ruled as unconstitutional by the Supreme Court. PEMEX tried to use a different type of contract (PEP, or Pemex Exploration and Production, Model Contracts) to skirt this regulation, but the investment climate had already been affected and these contracts were not lucrative enough to attract, or maintain, the kind of investment Mexico needed. Ultimately, Calderón’s reforms were unsuccessful in liberalizing the oil and gas sector, but they framed the political agenda for the 2012 presidential campaign, which would utilize energy reform as a centerpiece for candidates’ campaigns. 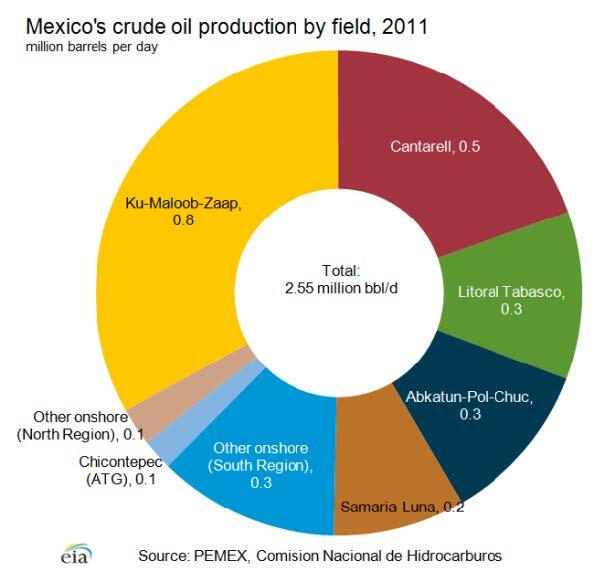 Mexico’s crude oil production by field, 2011. Energy Information Administration. By the time of the 2012 presidential campaign, Mexico was importing 49% of its gasoline, a third of its diesel, a third of its oil, and nearly a third of its natural gas (a trend aggravated by low natural gas prices in the United States). Furthermore, the 2013 budget for consumer subsidies for oil, natural gas, and electricity was set at $3.76 billion for the entire year. Subsidies for the third quarter alone were $6.46 billion. The revenues that the government receives from PEMEX account for over one half of PEMEX’s earnings and comprised 34% of the government’s revenue and 16% of its export earnings in 2011. The financial stability of PEMEX is thus closely linked to the budgetary stability of the government. Enrique Nieto’s administration aimed to actually amend Amendments 27, 28, and 29 of the 1917 Mexican constitution and create twenty one pieces of supporting, or secondary, legislation that would clarify these liberalization procedures. With the election of Enrique Peña Nieto, the PRI won the presidential seat and the supermajority of governorships, but only a plurality of Congressional seats. With the support of a supermajority PAN-PRI coalition, Peña Nieto began to institute fiscal, telecommunications, and educational reforms. However, none of these were as bold as his plans for the energy sector. The administration aimed to actually amend Amendments 27, 28, and 29 of the 1917 Mexican constitution and create twenty one pieces of supporting, or secondary, legislation that would clarify these liberalization procedures, e.g. the bidding process, the appraisal process of the reserves, the types of contracts that will be available. The secondary legislation should be approved by the end of April. The administration estimates that the GDP will increase by 2% and 2.5 million jobs will be added by 2025 as a direct result of these reforms. According to these reforms, the Secretary of Energy (SENER) will be given the power to grant licenses to private companies for all downstream activities, although licenses and production sharing contracts may not be granted for upstream activities. Exploration and production partnerships may only occur on a “contract for profit” basis, and Mexico will still retain full ownership of the subsoil and the hydrocarbon resources. SENER will manage the national reserves and identify areas for E&P, although this valuation process has still not been outlined. Then, the National Hydrocarbon Commission (CNH) will award contracts through “allocated entitlements.” During “round zero” of the contract distribution, which will theoretically take place by the end of September, PEMEX is allowed first choice of any available reserves provided it can develop and operate them commercially within 3-5 years. PEMEX may either then initiate development by itself or create a joint venture with a private company. It also retains the right to begin development by itself and transfer the “allocated entitlement” to a private company in a contract at a later date. Exploration and production partnerships may only occur on a “contract for profit” basis, and Mexico will still retain full ownership of the subsoil and the hydrocarbon resources. PEMEX may also bid on downstream projects, but those bidding rounds will be decided according to whichever company will be able to produce the most revenue, and therefore the most royalties for the state. Although previously enjoying only minimal regulation, PEMEX will now be subjected to the oversight of the CHN, the new Energy Regulatory Commission (CRE), as well as new environmental and safety regulatory bodies, according to its new statutes as an independent national oil company. Furthermore, PEMEX is required to become profitable from its own revenue by 2015. A stabilization and development fund, modeled after Norway’s Oljefondet, will be established in the Mexican Central Bank to hold revenue from the oil and gas sector. This is to ensure longterm development both of the sector and to provide social services that rely on oil revenue, such as education and pension funds. Will PEMEX Become the New PETROBRAS? In 2011, former Brazilian President, Lula da Silva, expressed a wish to create a partnership between Petrobras and Pemex. This sentiment echoed through Peña Nieto’s presidential campaign, when he said he wished to emulate Petrobras’ example of gradual liberalization. Following the example of Petrobras is a goal throughout the administration: Energy Minister Jordy Herrera has also openly expressed a desire to simulate Petrobras’ liberalization, and to reform Pemex to the point that it can become financially self-sufficient. The energy reforms are gradual, but they have already attracted the attention of Exxon, Chevron, and Lukoil. The energy reforms are gradual, but they have already attracted the attention of Exxon, Chevron, and Lukoil. Liberalization will not stop Pemex’s decline overnight, and if they are indeed following the lead of Petrobras, it could be up to a decade before they see significant improvement in production and export potential. The former director general of PEMEX, Adrán Lajous, echoed this time estimate, saying that the company will probably not see the benefits of the sector’s reform for at least ten years because it must shoulder the full costs of production and learn to operate within an open, competitive international oil and gas market. Stephanie Bryant is an MA student in the ENERPO program at European University at St. Petersburg. “How High Can PEMEX Fly?” The Economist. The Economist Newspaper, 23 Jan. 2014. <http://www.economist.com/blogs/americasview/2014/01/mexicos-energy-reform&gt;. “RPT-Fitch: Mexico’s Energy Reform Positive for Pemex, Challenges CFE.” Reuters. Thomson Reuters, 04 Feb 2014. <http://www.reuters.com/article/2014/02/04/fitch-mexicos-energy-reform-positive-for-idUSFit68518420140204&gt;. “Mexico.” U.S. Energy Information Administration – Independent Statistics and Analysis. 27 Oct 2012. <http://www.eia.gov/countries/cab.cfm?fips=MX&gt;. “Mexico Crude Oil Production By Year.” Index Mundi. <http://www.indexmundi.com/energy.aspx?country=mx&product=oil&graph=production&gt;. Negroponte, Diana V. “Mexican Energy Reform: Opportunities for Historic Change.” The Brookings Institution. 23 Dec 2013. <http://www.brookings.edu/research/opinions/2013/12/23-mexican-energy-reform-opportunities-historic-change-negroponte&gt;. Negroponte, Diana V. “Mexico’s Most Critical Challenge: Energy Reform.” The Brookings Institution. N.p., 20 Nov. 2013. <http://www.brookings.edu/research/opinions/2013/11/20-questions-about-energy-reform-mexico-negroponte&gt;. Rodriguez, Carlos M., and Adriana Caraveo. “Mexico Oil Opening First Time Since 1938 Shows Revival: Energy.” Bloomberg.com. Bloomberg, 26 Apr. 2012. <http://www.bloomberg.com/news/2012-04-25/mexico-oil-opening-first-time-since-1938-shows-revival-energy.html&gt;. Samples, Tim, José Luis Vittor. The Past, Present, and Future of Energy in Mexico: Prospects for Reform Under the Peña Nieto Administration. Houston Journal of International Law, 35:3. Accessed via <http://papers.ssrn.com/sol3/papers.cfm?abstract_id=2315306&gt;. Schecter, Peter, and Jason Marczak. “Mexico’s Energy Reform Will Benefit U.S.: Column.” USA Today. 24 Dec. 2013. <http://www.usatoday.com/story/opinion/2013/12/18/mexico-constitution-energy-column/4075943/&gt;. Snow, Nick. “Second Phase Critical in Mexico’s Energy Reforms, Officials Say.” Second Phase Critical in Mexico’s Energy Reforms, Officials Say. 17 Jan. 2014. <http://www.ogj.com/articles/2014/01/second-phase-critical-in-mexico-s-energy-reforms-experts-say.html&gt;. William, Adam, Eric Martin. “Big Oil to get Brazil-Like Terms in Energy Plan.” Bloomberg.com. Bloomberg, 5 Dec 2013. <http://www.bloomberg.com/news/2013-12-03/mexico-parties-said-to-agree-to-sovereign-fund-with-energy-bill.html&gt;. Williams, Adam, Eric Martin, and Nacha Cattan. “Pena Nieto Signs Energy Overhaul Ending Mexico Oil Monopoly.” Bloomberg.com. Bloomberg, 20 Dec 2013. <http://www.bloomberg.com/news/2013-12-20/pena-nieto-signs-energy-overhaul-ending-mexico-oil-monopoly.html&gt;.